Every year the Glasgow Film Festival brings the best of cinema from all around the world to the Dear Green Place, but, crucially, it never forgets where its 'fae'. The festival makes a point of showcasing homegrown talent and being a platform that celebrates local filmmakers. These stories are ones that deal with identity, life, belonging, and strike close to home because they portray people just like us. With this in mind, we've rounded up some of the highlights from the GFF's Local Heroes strand with films from Glasgow, Scotland and around the UK. They deal with issues close to home like the rise of acid attacks, the scourge of male suicide and the uncertainty of the fishing industry – themes which will both resonate and be familiar to most. 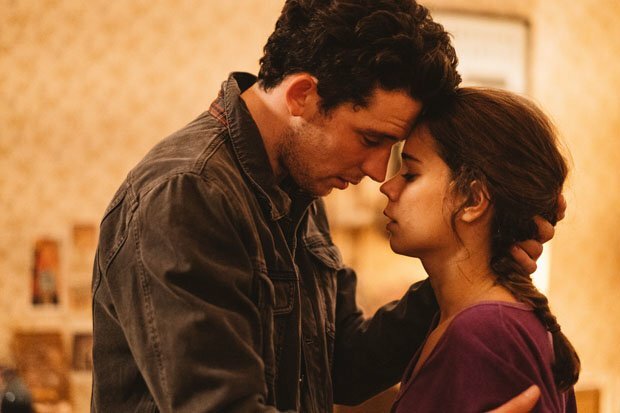 After meeting by chance on Hogmanay in Glasgow, Elena (Laia Costa) and Jake (Josh O'Connor) fall madly in love with each other and embark on a meaningful relationship that seemingly counts more than the significant age gap between them. As things get more serious, plans for a family put a strain on their relationship and the hardships of IVF are devastating. The film is an empathetic examination of modern love and the emotional stress that fertility issues and treatments put on a relationship. Only You is the first feature debut from writer-director Harry Wootliff. Glasgow Film Theatre, Fri 22 Feb.
Up for GFF's only prize, The Audience Award, is BAFTA Scotland award-winning filmmaker Matt Pinter and his documentary on Harry Birrell. Birrell was an amateur film-maker and spent his entire life recording everything from family parties to years spent in faraway places during the world wars. This documentary, narrated by The Bodyguard's Richard Madden, plunders Birrell's 400 films and diaries to create a fully-formed depiction of one ordinary person's life in the 20th century. Glasgow Film Theatre, Sun 24 & Mon 25 Feb.
North Berwick becomes the setting for Marilyn Edmonds drama tackling the major issue of male suicide. After Brian (Kevin Guthrie) experiences a significant loss, no one would know that he was suffering from the way he gets on with everyday life. However, after striking up a friendship with Jeff (Stephen McCole) and a budding romance with Sam (Siobhan Reilly), it becomes clear that he can finally learn how to share his real feelings. The clash between deeply pessimistic and hopeful optimism, set against the raw backdrop of North Berwick, make for a poignant and emotional piece. Edmond's describes it as a modern version of It's a Wonderful Life. Glasgow Film Festival, Sat 23 Feb & Sun 3 Mar. Ashley Joiner directs this poignant documentary feature made up of rarely seen archival footage from the LGBTQ+ movement in the UK. It celebrates achievements that have been made through time and also questions what needs to be done to ensure equality for everyone across the spectrum. The film meets with those at the front of the movement including the Gay Liberation Front, Stonewall, Black Pride, Trans Pride Brighton and Queer Picnic. Essential viewing for those interested in how far this country has come and figures and groups who made this possible. CCA, Thu 28 Feb & Fri 1 Mar. When the only trade you have ever known comes under intense scrutiny, how do you cope? Brothers Kevin and John Pullar are Scotland's last traditional net fisherman and try to sustain their family's business of fishing for wild Atlantic Salmon. However, their work is now being thwarted by environmentalists who follow them to try and protect endangered species and seals. This documentary sets out arguments from both sides, the environmentalists and the traditional fishermen, in a balanced examination of both group's frustrations. CCA, Sun 24 & Sun 25 Feb.
Sacha Polak's English language debut deals with the rising incidents of acid attacks in the UK and the contradictions between how you look and how you feel. Young mother Jade (Vicky Knight) is the victim of a horrific acid attack and is left with half of her body covered in scars. Having to deal with abuse from strangers and her own daughter calling her a 'monster', she struggles to remember who she is and copes by throwing herself into the South London clubbing scene. The film was part of the Official Selection at Sundance and lead actress Vicky Knight is a burns survivor herself. Glasgow Film Theatre, Sat 2 & Sun 3 Mar.